Wearing Punit Balana separates, Shilpa filmed an episode of her television show. Aside from the metallic Fizzy Goblet jootis, she rounded out her look with jewelry from Azotiique, Silver House and Curio Cottage. At the taping of another episode of Super Dancer 2, Shilpa was seen in separates from Roshni Chopra with bracelets from Amrapali. I don’t mind a fusion look but in this case, as cute as the top was, didn’t quite like the separates. Possibly because of the sheer dupatta. Were you a fan of the separates? Continuing to change things up, for a latest appearance of hers, Kriti picked a suit by Neh to wear. With her hair in a braid, she rounded out the look with Sangeeta Boochra earrings and Fizzy Goblet jootis. Love the easy, fuss-free look; it makes for a nice change of pace on these pages. Kriti looked nice. 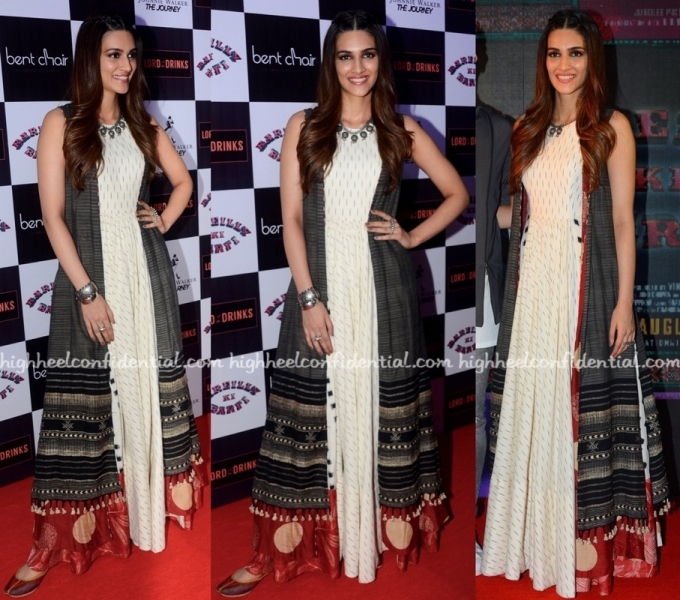 For the music launch of her upcoming movie, Kriti picked Label Anushree separates to wear. Jewelry from Amrapali and Sangeeta Boochra and Fizzy Goblet jootis rounded out the actor’s look. 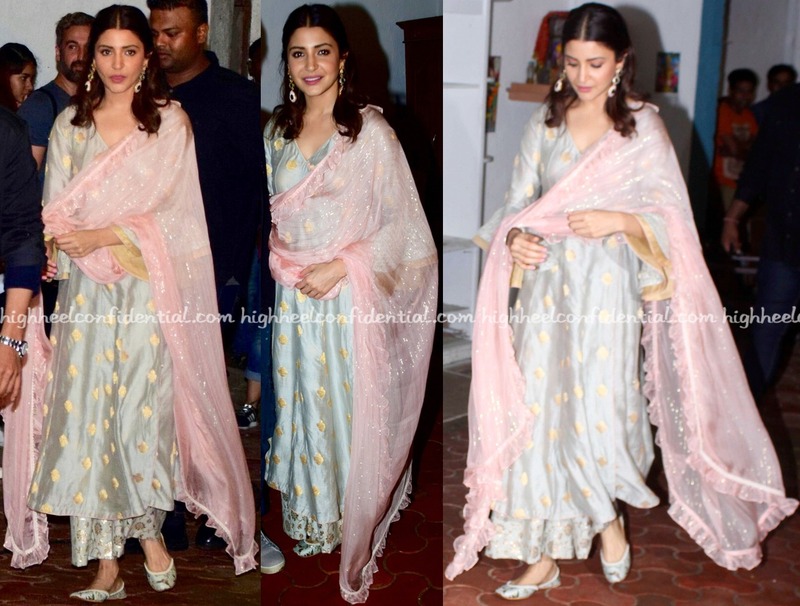 Wearing a pastel suit from Kotwara, Anushka promoted her upcoming movie on the sets of a television show recently. With her hair partially pinned back, she rounded out the look with oversized earrings from Curio Cottage and pair of matching Fizzy Goblet jootis. Given her recent few sightings, this appearance made for a nice change of pace. 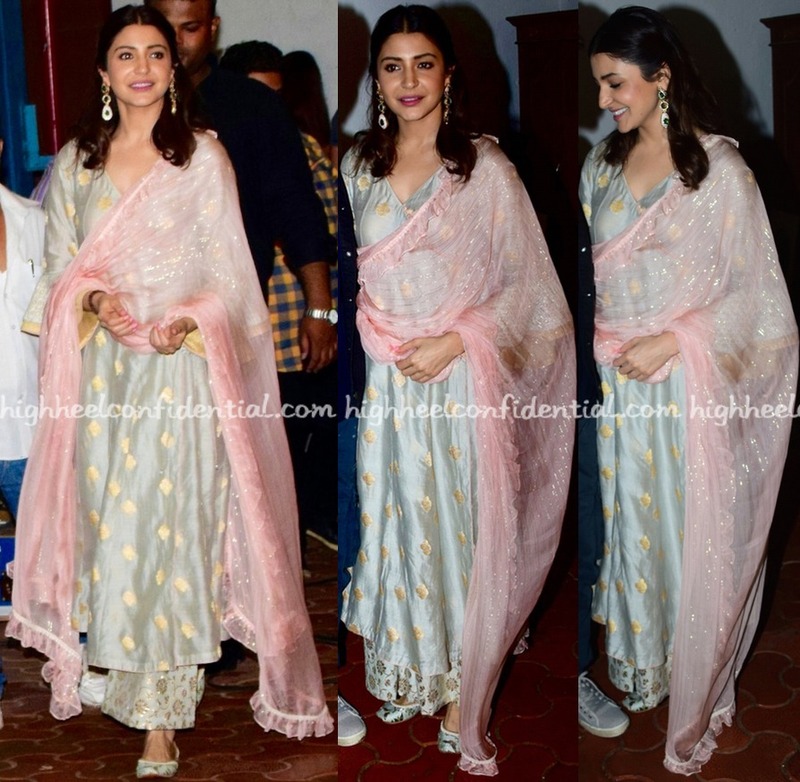 Anushka looked nice.